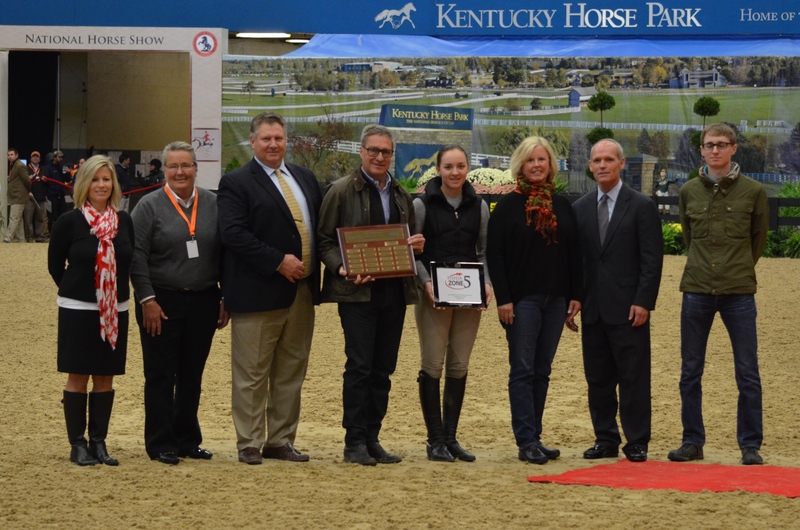 Photo Above: Awards presented to 2014 Zone 5 Horseman of the Year, the Kentucky Horse Park Foundation and Mindy Darst. Pictured (Left to right) Maria Holt, Patrick Boyle, Greg Darst, Maddy Darst, Patti Rogers, Lulu Thomas, Laura Crum, Nina Bonnie, Diane Carney, Bill Moroney and John Darst. Photo by Chicago Equestrian. Lexington, KY – November 1, 2014 - The United States Hunter Jumper Association’s Zone 5 initiated two Horseman of the Year awards, which were presented at the 2014 National Horse Show in Lexington, KY during Saturday’s events. The USHJA Zone 5 Horseman of the Year awards will be presented annually and will recognize those dedicated horsewomen and horsemen who have contributed time, knowledge, treasury and/or other assistance to the betterment of the sport. The award has two categories; contemporary and posthumous. Those eligible to receive the honor include individuals, groups of horsemen, riders, owners, breeders, and those who have tended to and provided care for horses. Additionally, eligible recipients must be or have been a resident of Zone 5 for a minimum of 20 years, must be or have been a USHJA and USEF member in good standing, and must have contributed to the betterment of the sport. USHJA President Bill Moroney, USHJA Awards Manager Marla Holt and Zone 5 Committee Chairs Patrick Boyle and Diane Carney, presented the 2014 awards to the Kentucky Horse Park Foundation and the late Mindy Darst. The Contemporary Award winner, The Kentucky Horse Park Foundation, was founded in 1985 and Nina Bonnie was chairman of the foundation board for 19 years. She was joined on the Foundation board by many other dedicated individuals who gave their time and resources over the years to securing the future of the park and its competition venues. The Kentucky Horse Park opened its gates in the 1970’s, as a realization of the Commonwealth of Kentucky’s desire to provide hands on, working horse farm experience for local residents and visitors to the state to enjoy. A pivotal moment in its history came when Governor Martha Layne Collins appointed national horsewoman Cornelia W. Bonnie, Nina, as the first Chairperson of the Kentucky Horse Park Commission. It is through the vision of the Kentucky Horse Park Foundation’s founders and the generosity of its donors that today the Kentucky Horse Park can provide a home for dozens of prestigious competitions each year, including the National Horse Show. The Kentucky Horse Park Foundation is honored to be the recipient of this prestigious award from USHJA 's Zone 5. The Foundation expresses its sincere gratitude to all who have supported the Kentucky Horse Park over the years, and invites each of you to consider continuing to provide charitable support for this wonderful park moving forward. To make a donation, please visit www.khpfoundation.org. USHJA's Maria Holt, Zone 5 Chairpersons Diane Carney and Patrick Boyle, Greg Darst, Maddy Darst, Patti Rogers, USHJA President Bill Maroney and John Darst for the presentation of the Posthumous Award to the late Mindy Darst. Photo by Chicago Equestrian. Mindy Darst, the Posthumous Award winner, dedicated her life to the sport as a child rider and competitor, college competitor, coach of Ball State University’s national championship equestrian team, professional trainer and owner of Lochmoor Stables. She was a nationally known and highly regarded trainer, clinician and R judge. Her other accolades include: four time winner of Ohio Hunter Jumper Association’s Trainer of the Year, three time recipient of the National Pony Finals/Edna Lytle Volunteer of the Year; USHJA Volunteer of the Year; and AHJA Sportsmanship Award winner. Mindy held multiple USHJA leadership roles, including: USHJA Board of Directors; Zone 5 Chair; Hunter Zone Council; Officials Committee and Pony Hunter Task Force Chair. The Zone 5 College Scholarship is also named after Mindy. Mindy Darst made it her passion to instill in her young students a belief in themselves that carries over into and past their horse career to their adult and professional lives.